This unused area behind the church will be converted into a feeding center. 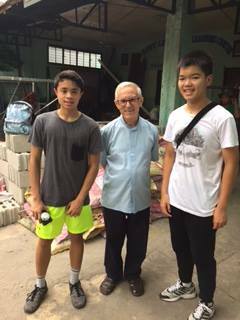 In photo: Co-founders, Joshua Emmanuel Tan and Basti Belmonte with Fr. Julio Cuesta. What used to be a dark and dirty area is now a beautiful, clean and well-lit feeding center and study hall. Special shout out also goes to Perfect Dimension, who helped us in the construction of the feeding center. Now that the feeding center is up and running, we continue to raise funds to feed the children 5x a week, Mondays-Fridays. Joshua Emmanuel Tan, Co-Founder of The MEALenium Project before the opening of the feeding center.